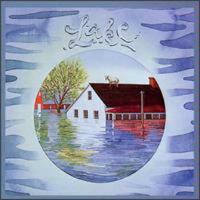 Lake was one of the great unknown bands of the 1970s. The group combined strong pop melodies with definite progressive rock-oriented arrangements. This album, obviously the group's second, features a lot of different textures. From the pop/rock-oriented "Welcome to the West" to the Elton Johnish ballad "Love's a Jailer," this entire album is a treat. Although the majority of the disc is in a definite singalong sort of pop style, there are still some quite meaty instrumental sections that lead to the progressive rock reference. The music here is quite strong prog-oriented pop with a very unique guitar sound, and the vocals seem to call to mind a combination of Journey's Steve Perry and Yes' Jon Anderson. This is a great Supertrampish prog cut with strong pop elements. This one is features a great progish ballad type intro and early verse and an arena rock styled chorus. This one has a great melody line. "Letters of Love" is fairly hard edged and energetic pop oriented music with strong prog sensibilities. Featuring some wonderful keyboard textures, this is a great missing your love sort of ballad. A song about the perils of drugs and having nothing to do with the cartoon character, this one is a potent piece that is a musical building extravaganza.